Today would have been your first Halloween. Halloween has always been a holiday that I have enjoyed, but I wouldn’t call it a favorite. As a kid, I enjoyed dressing up and going trick-or-treating, but was easily scared by other costumes. My earliest Halloween memory is of Pa taking your auntie and me to a local park for a kid-friendly haunted trail. Well, it scared me silly and I cried the entire time. Grammy always made my Halloween costumes, including a cheerleader, apple for the teacher, 50’s girl, witch and many, many more. My favorite part about Halloween has always been carving pumpkins. I guess that’s the artist in me! It’s no wonder that I cried hysterically when the mean boys in the neighborhood smashed my wonderful creations, on more than one Halloween. Your Daddy and I continued to carve pumpkins well past our high school years, even before your brothers were born. Most Halloween’s were filled with lots of fun parading at school, trick-or-treating with family and sharing candy with friends. In elementary school, we always had a Halloween parade and the teacher’s costumes were the best. They always had a theme: Sesame Street characters, The California Raisins, etc. The principal was Darth Vader one year, with a costume that could have come straight from the movie. Every Halloween, my parents loaded your auntie and me up in our costumes and we went trick-or-treating at your Great-Grandparents house. Then we went back home and got to go around the neighborhood together. My last official year of being allowed to dress up, some friends and I dressed up as old ladies. I remember these Halloween’s like they were yesterday. Oh, I how wish I could go back in time every now and then. Now, Halloween is filled with doing fun things with your brothers. Oliver wanted all of us to dress up this year, so he and I were pirates, while Garrison and Daddy were doctors. Garrison got to go in costume to story time at the library Monday. He enjoyed guessing what all of the other kids were dressed up as. At pre-school, they both had a Halloween parade and party with their class. We carved pumpkins as a family last night and went trick-or-treating at church tonight. I think they both have had a good Halloween week, but I have failed to do some of the things that I had either planned to do, or things that I have done in the past. I know they don’t know any difference, but I do. We included you in our Halloween activities. The boys and I went to a pumpkin patch with friends a few weeks ago and we bought a little pumpkin just for you. It sits under your Dogwood tree that is planted in the front yard. Your brothers found some orange pinwheels and I bought a pumpkin candle holder, all to decorate your tree with. 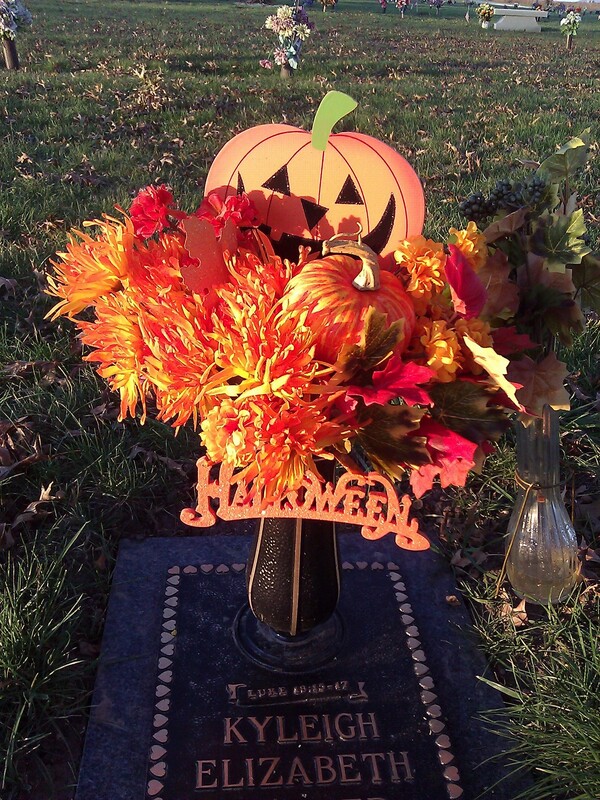 I bought some fall flowers and added some fall leaves and a pumpkin to make a new arrangement for your headstone. I also found a cute Halloween sign and a jack-o-lantern to include with the flowers. It wasn’t until we went to the cemetery a few days ago to place your new arrangement that it hit me. How messed up is it that the only way we can dress you up for your first Halloween is by putting pumpkins and leaves at your grave? While your Daddy and I have had a fun Halloween with Oliver and Garrison, there is a sadness that always creeps in while celebrating anything because you are not here to celebrate with us. I have a feeling that Halloween is not celebrated in heaven, only because one day in heaven has to be better than 1,000 Halloween’s. That’s what keeps me going on a day like today. Happy Halloween! I love you! As a child, I did not like hospitals. At all. I was not a fan of needles, blood or anything medical. Thankfully, I was never in the hospital as a child, but visiting others was always an uncomfortable experience. Even as an adult, I prefer to stay away from hospitals unless absolutely necessary. When I was in the hospital to give birth to my children, the only way I made it through was to remember that I was there for my children. I’m sure I would have handled it differently if I was in the hospital for another reason. My fears were subsided, but not completely gone. Obviously my experience in the hospital when Kyleigh was born was much different than when I had been in the hospital before, both emotionally and medically. I had emergency surgery, a variety of tests/procedures done and many vials of blood drawn. Not my idea of fun, even if my daughter had lived. Somehow, I made it through. I think my emotions had overtaken my body so much that they could have poked and prodded me all day and I wouldn’t have noticed. I became as comfortable in my surroundings as I could. I’m sure having a very supportive doctor and wonderful nurses helped immensely. A family member has been in the hospital for the last few days. I have been to see her three times, once, staying as long as four hours. In the past, I would have been a ball of nerves and probably would have only gone once or twice for a very short amount of time. This time, I felt comfortable going. It wasn’t a big deal to walk into a hospital that I had never been in on a Sunday afternoon. Since it was the weekend, there was nobody at the information desk to tell me where to go. I navigated my own way to her room without any anxiety. I was comfortable talking to the nurses and making requests on the patient’s behalf. So why then did I burst into tears last week when I read Curious George Goes to the Hospital to my boys? Did I really cry over a monkey? It wasn’t because Curious George was sick. It was because of the detail it gave about being prepped for surgery. And we’re talking about a children’s book, so the detail was really not that detailed. About a month ago, I was among a group of about ten people. Someone started talking in detail about a surgery that they had. I had to get up and leave the room. I have discovered that any talking and I guess now reading, about surgery is a trigger for me. I can’t handle it. On Saturday I went to Kohl’s to do a little shopping for everyone. I needed to pick up a few things here and there for both boys, as well as Rodger, and I was hoping to find some new clothes for myself. As soon as I walked in the door I knew I was in trouble. Christmas decorations were everywhere. All I wanted to do was turn around and walk back out, but I knew this was the only time when I could get this shopping done by myself. I was doing okay until I went to look for pants for Oliver. Of course the Boys section is right across from the Baby Girl section. I tried not to pay attention. Then a “Mommy’s Little Turkey” outfit practically jumped off the rack at me. It hit me like a ball to my gut. I might as well have just left at that point. I struggled the rest of the time that I was shopping and while I found what I needed for all the boys, nothing fit or looked right on me. I’ve figured out why I am seeing so many “I’m expecting! !” posts on Facebook these days. And why everyone is now due in April. This is the three month mark. Twelve weeks. End of their first trimester. The point when most, except for those who find it acceptable to snap a photo of their pee stick as soon as it turns positive, announce they are expecting. Another trigger. Another thing that brings my emotions to the forefront. Another thing that hits me out of nowhere and upsets me, usually for the remainder of the day. It’s not that I’m not happy for these people. I just don’t want to share in their happiness right now. It’s just another reminder that at this point last year, I was almost four months pregnant with Kyleigh. All was well. We made it to the end of our first trimester. After that, there was nothing to be worried about, right? Some of these things that trigger my emotions are expected. I know that hearing or reading about someone else being pregnant/having a baby upsets me, except for a few dear souls in my life. The problem is you never know when someone is going to post that fact on Facebook, or how they are going to do it. It’s almost become an unwanted contest of who can do it the best. Other triggers come out of nowhere. I don’t know what others are going to talk about around me or even how it is going to affect me. I don’t know what is lurking around the corner at the store or what song is going to come on the radio next. I heard a song on the radio just a few days ago that I had never heard before. It was a beautiful song and the lyrics were written for me, I am sure of it. As I listened, the tears started. I haven’t heard the song since. At some point, I know I will hear it again. Will it trigger me to cry the next time? I no longer cry at the songs that we played at Kyleigh’s service, but I’m always quick to turn the radio up extra loud and tell the boys to listen when they come on the radio. There are some triggers that are diminishing. Thursday’s used to be horrible days for me. Those around me could pretty much count on Thursday’s being the roughest day of the week. That has stopped. I have admittedly lost count of how many weeks it has been since Kyleigh left us. I’m sure that has something to do with Thursday’s not being a trigger for me anymore. I am still very aware of the 5th of each month and expect that that day will be a struggle for some time now. I wonder when I will stop counting the months (it will be seven months on November 5) and only count the years. Does that progression happen just like it does for the aging of a living child? I know for me, I told my boys’ age in months until they turned two. Will it be the same for Kyleigh? I know all of this is normal. I have been told by some that even after five or more years, something still comes out of nowhere and makes them stop still in their tracks. A smell, a sight, a sound or a taste takes them back to a place they never want to go to again. But, at the same time, it makes them remember their child and brings a smile to their face, even after all the tears. This is something our oldest generation knows implicitly. It’s a reality that my parent’s generation has learned by practice and that my generation continues to avoid as we all near mid-life while our children simply have no means of understanding. For most people this is learned our the course of a lifetime, but for me, these past six months have shown this truth stronger than almost any other. 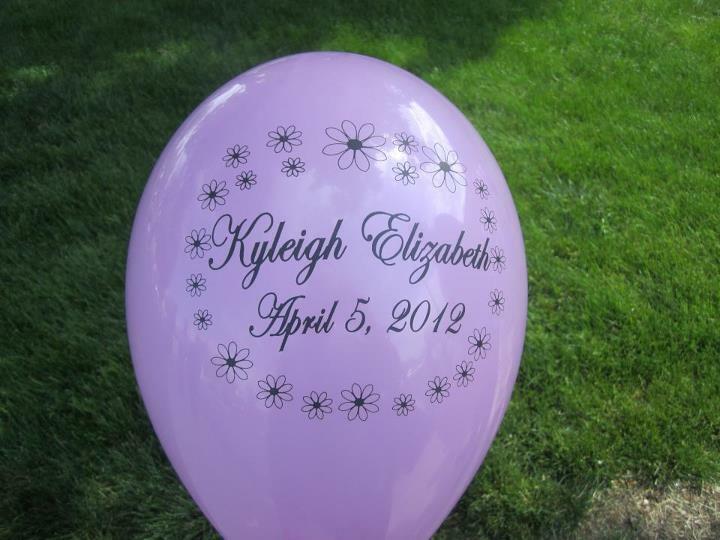 It’s been six months from Kyleigh’s birth, and those six months have passed like the breeze rolling off the Rockies. The weather is turning colder, the boys are growing older and life has certainly fallen into a new normal for us. Smiles and laughter have largely replaced the heart-ache and tears of those first few months. There are still times for sure, certain triggers that take me back to those moments when time stood still. But overall, I think it’s safe to conclude that our focus has changed. There’s not much secret that Leann and I are practicing Christians. We’ve made our confessions and we are eternally secured by the grace of God. While that took care of the most important transaction in life, there still comes about this messy practice of living life until it’s our time to move on to the next. And while we look forward to that blessed reunion, there’s still work that we must do on this side. So why not live fully? Why not embrace whatever life has to offer? To live passionately and love completely? Many people have reasons to live in their past. To dwell on what might have been perhaps in fear that if they let go they’ll forget what memories they have. While it’s true some minor details may fade, the idea that we would forgot those life altering moments is pretty absurd. I prefer to think of it this way. I’ll take what few moments that I have left and fill them with new memories, fresh experiences, a renewed zeal and passion that surpasses all understanding. After all, lest we forget in the midst of our busy-ness, life is nothing more than a vapor.